Objective: To determine the efficacy of albuterol delivered via metered-dose inhaler with spacer for the treatment of wheezing infants. 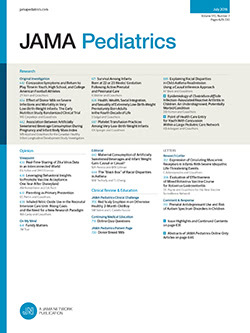 Design and Setting: Double-blind, prospective, placebocontrolled, clinical crossover trial undertaken at the emergency department of a university-affiliated children's hospital. Participants: Forty-two patients aged 1 to 18 months presenting to the emergency department with wheezing. Intervention: Subjects were randomly assigned to one of two blinded treatment groups. Group 1 received two albuterol treatments followed by two placebo treatments. Group 2 received two placebo treatments followed by two albuterol treatments. Each treatment consisted of two puffs from a metered-dose inhaler with spacer at 20-minute intervals. Measurements/Main Results: On enrollment and 20 minutes after each treatment, a clinical assessment was made by the principal investigator, which included heart rate, respiratory rate, pulse oximetry, wheezing score (0 to 3), and retraction score (0 to 3). Both treatment groups had statistically significant improvement in mean wheezing score associated with albuterol therapy (P<.05 using Dunnett's t test). Mean retraction score improved over time in both groups only during drug therapy. However, the improvement of only group 2 reached statistical significance (P<.05 using Dunnett's t test). Scores were then classified as "improved" and "not improved" for analysis with McNemar's test. Group 2 had a statistically significant proportion of patients with improved retraction score related to albuterol therapy. The remaining dichotomized results, while not achieving statistical significance, showed a trend in the direction expected from a beneficial drug effect.